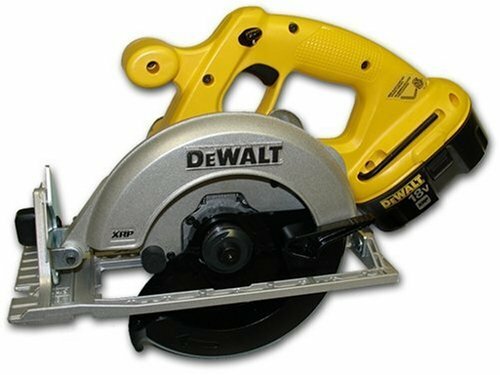 Featuring a beefy, 18-volt motor and XRP battery this 18-Volt Circular Saw Kit cuts over one hundred 2-by-4's on a single charge. The blade is located on the left side for better visibility and has a spindle lock for easy changes. The motor is fan-cooled and has replaceable brushes for increased durability. With a maximum of 3,700 rpm, this circular saw can finish large projects in no time. The shoe bevels to 50 degrees, and the 6-1/2-inch blade can cut 2-inch material at 45 degrees. The saw weighs just 8.7 pounds for easy handling. Your purchase includes 18-volt circular saw, 1-Hour Charger 18V XRP Battery Pack, 16-Tooth Carbide Saw Blade, Blade Wrench, Rip Fence and a heavy-duty storage case. Good quality & Value...Adequate power and run time. Comes with arbor tool. quick and easy depth and angle adjustments. I've only done light work with it, but so far it shows all the signs of working as well as most DeWalt gear. Only one battery, but I already have two other 18v DeWalt tools, so that doesn't really make a difference to me. Yes, it would be nice to have a more substantial blade guard and it wouldn't have added much to the price. In other reviews people have complained about the safety being awkward, but I gfind it natural to push it off with my thumb, no problem. It's about time DeWalt shifted to a more modern battery technology though, NiMH batteries hold much more power and have a much longer and less troublesome service life. I got this saw as part of the 6pak combo. First thing I noticed is that your finger immediately gets trapped and pinched between the trigger and the handle. Yes it has plenty of power and torque, I was impressed by that when I made my first cut. But all cordless saws, even Ryobi are good enough for what most people need. But everytime I pick this thing up, I am reminded to pull on the triger in an un-natural way so that I dont scrape my index finger against the sharp seem of the plastic handle. This needs to be redesigned for the nano version. I am so annoyed by this seemingly slight problem, I'm now open to owning other brands, I was a dewalt loyalist for years. This tool also lacks any rubber over-molding on the grip or front handle. It just looks dated compared to the other tools in the combo. I know tools are about power and performance, but with dewalt, thats a given, so these other kind of details are becoming important to a guy who has cordless tools in his hands all day. Just look at the odd angle of the guy holding the saw in the pictures above, he looks awkward and scared. The handle dynamics of this tool need to be re-addressed to be in a more natural wrist position. The rip fence is something that I never used before. I just now discovered how convenient this little thing can be. However, the set screw is buried between the motor and the front of the base plate hinge. Your cant get your big knuckles down in there to get a good turn on it. The knob needs to be a little further back towards the motor and be taller, that would make it easier to grasp. The markings on the rip fence start at the fence and are at inch intervals along the the rest of the bar as it slides into the base plate......these markings should be arranged in such a way to indicate the distance from the blade its-self, to the fence. So ideally you can just set it at 4 inches and know that the piece your about to cut is going to be 4 inches wide. As it is now, the inch markings on the fence just serve as a ruler that has no relation to the width of your cut. Oh and the rip fence generally dosen't really work that well, even if they fixed the flaws that I've mentioned. Overall, I'm going to start trying other people tools to see if I should go in a non yellow direction in the future. This saw cuts smooth, has a nice little depth gauge feature, and is balanced pretty well. My complaint about it is that it is for a left handed person really. I've never liked these these kinds of saws because if you are a right handed person, then when you need to trim off a 1/2" from a board, you are gonna do it with the board being held in your left hand. With this saw, that sort of cut is difficult because you have no saw base to rest on the board. Some people think it's great because you can easily see the blade, but if you know how to use a saw you don't need to always see the blade. It has good quality construction, so I still gave it a 4. Knowing what I know now I would not buy this saw again. My sawdust manufacturing facility is in the cellar and I never build anything that requires a full sheet of plywood. To save on the hassle of power cords I bought this saw to rip plywood as needed into a manageable transporting size. I find this saw to be way underpowered, the blade speed seems extremely slow. I find it very difficult to cut a strait line even when using a guide. everything you could expect from a cordless circular. comes with guide. latch on guard is pressure locking, so tends to come loose with constant sawing, but overall a great saw. When i burned out my corded circular saw I'd had for 17 years, I figured it was time to break down and get something a little more portable. I was surprised at how light, but solid feeling the saw was. Not unlike other DEWALT power tools I own, this critter does not lack power. The first job I used it on was was cutting stringers for a deck. Three in all, 9 feet each. Handily did this job in a single charge and I used the blade that came in the kit. Any time you break in a new circular saw, you have to figure out which portion of the front blade guard to line up with your cutting line. Mine lined up perfectly, right where you'd expect it to, making it simple to make straight, accurate cuts. I even had to rip a 4 foot board for a header as I was building the deck stairs and I used the rip guide that came with it. After a few minutes of trying to tighten the little nut that secures the guide to the saw, I was off and running. Even with a little pinching at the end of the cut, the DEWALT did fine. I don't exclusively buy DEWALT, but these are pretty tough job site tools. I left my drill out one night and as luck would have it, we got rain. Dried it out and two years later, still runs like a charm. Can't wait to build another project with it.... shhhhhhh don't tell my wife i've already bought the lumber for it.